Explore el interior de Surinam en una popular excursión guiada de un día desde Paramaribo. 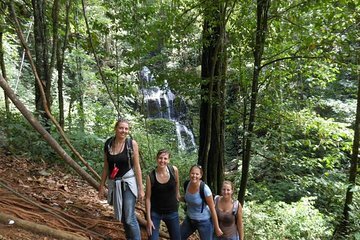 Caminará a las cascadas para tener la oportunidad de nadar, y aprenderá sobre la flora y fauna local de su guía en el camino. En lo alto de la montaña Browns, disfrute de un almuerzo buffet en un bar con vistas panorámicas al embalse de Blommenstein. There is not much to see. The waterfall is not impressive at all. I mean it is not worth a 3 hour drive and 3 hour walk to see it. The tour guide was very nice. But on the way back he explained he could not drive us back. So hired a driver to drive us, we did not feel secure with this guy new driver. On top of this, the new driver stopped in the middle of the road, and asked us to change to another car, with a new driver. This never happened to me before in any tour. Plus on of the drivers did not speak any english. the guide who walked with us to the waterfall either. A little bit difficult way to the waterfall and backwards. But the whole trip to the jungle was nice.